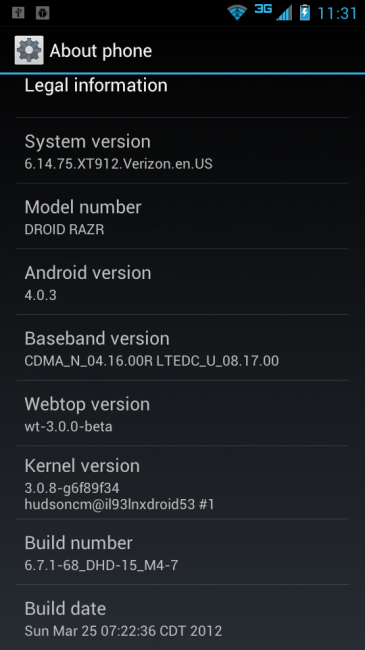 After yesterday’s news that Ice Cream Sandwich would be released next week for the DROID RAZR and RAZR MAXX, a soak test invite for Motorola Feedback Network members was quickly sent out which seemingly confirmed that the update was upon us. This morning, a leaked Android 4.0.3 (version 6.14.75) build briefly became available from the crew over at DroidRzr.com, however, it was then pulled as the normal methods for flashing were not working as expected. From what we know though, thanks to a couple of successful flashes, a new webtop software is included, obviously a new ICS UI, new radios, and version 4.0.3 of Android. What we aren’t sure about yet is if this is the official build that could be pushed to devices in the coming days. If you are interested in potentially flashing, you will want to keep an eye on this DroidRzr thread. Cheers Patrick, Johnny, and Mal_Eskrito!